I am a voracious reader. It took me a week to burn through The 4-Hour Workweek by Timothy Ferriss, and before that just 24 hours for The Color Purple by Alice Walker. While writing this post, I realize they both have an important common theme: to be happy, find excitement, and live your life on your own terms. 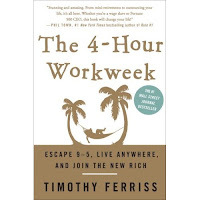 I love The 4-Hour Workweek, but this book isn't for everyone. It requires a paradigm shift to accept mini-retirements and vacations and reject the "deferred-life plan" (i.e. work 9-5 or longer hours in the corporate world, save, wait, and then retire later in life when you are too old to really enjoy it). If you read my last Time Track post, you know I was more than willing to accept this. I've defined my fears and outlined everything that would happen if I were to completely fail in my business. It's really not as scary as I thought. I check my email twice a day, and only after I've done the top 1 or 2 most important things to be accomplished that day. Business planning- Ferriss goes over how to start, automate, and outsource your business. He provides some great tips, but critics have said he makes it sound too easy. It's true your business could fail, but that is not the focus of the book. He makes you admit that at the beginning, then answers the question, "What if it doesn't fail?" It's better to run your business than have it run you.